Mr Tan Soy Kiang, 70, had been paying off a debt he was told he owed. Even after taking on two jobs and handing over $53,000 of his retirement savings, Mr Tan struggled to make good. For 15 years, he had to borrow money from neighbours and his 73-year-old sister to feed himself because all his income went to servicing the debt. No one stopped to ask him about the debt, or how he survives. Until his niece returned from Australia in 2013. What she learnt shocked her. 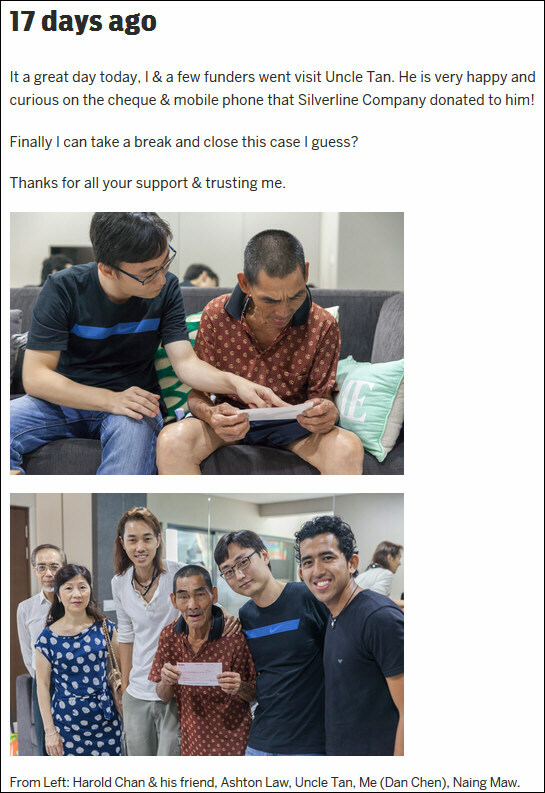 Mr Tan, who is single and used to live alone, has been the victim of a malicious scam. Two Singaporean women allegedly got him to hand over all the money he earned for a debt they claim he owes the Government. There was no debt. It is believed Mr Tan, whom his niece describes as being simple-minded, was conned into giving more than $400,000 of his hard-earned money. He was never told how much he actually owed but he trusted the women who he had known for years. And he believed them when they said he would be in serious trouble if he didn't pay up. "My uncle was constantly hungry and was always borrowing money from my mother and the residents at Kim Keat Avenue. He has two jobs. There is no way he doesn't have enough money to take care of himself. "I questioned him constantly until he revealed what was happening," Ms Pamela Lim, 39, a real estate agent, tells The New Paper on Sunday. Now one of the women has been arrested and the other is assisting police with their investigation. Mr Tan, who cannot stand up straight due to a spinal injury, works as a cleaner from 7am to 11.30am along Kim Keat Avenue. He is paid about $1,000. After a short break at his flat at Lorong 1 Toa Payoh, hereports for work as a pump attendant at the Esso station along Lorong 2 Toa Payoh from 4pm to 10.30pm. That job pays him $1,000. Every month, one of the two women would wait near the petrol station on his pay day or the next morning at Kim Keat Avenue to collect the money. The women, aged 65 and 69, allegedly told Mr Tan he owed money to the government and that he has to settle the debt through them. Mr Tan's ordeal only came to light when Ms Lim returned from Australia after living there for 15 years and discovered that he was giving every cent he earned to the two women. Her uncle says in Teochew: "At first I told her I used to have a failed business, that I'm still paying up the bad debt but she didn't believe me and kept on and on at me until I confessed what was really happening." Ms Lim called the two women and set up a meeting a year ago. She confronted them and they allegedly confessed in a video which TNPS has seen. The police has a copy of the video. Ms Lim wanted "to settle the matter amicably" and have them return the money to her uncle. "I got them to confess on video what they did and even had them agree they would pay my uncle back. We were nice enough to agree that they return $500 a month. "After that we went to make a police report. Unfortunately, my uncle was deemed a willing party then," she recalls. Despite promising to stop their alleged extortion, the women started again last August. Frustrated, Ms Lim spoke to TNPS and made another police report. On Wednesday, Ms Lim handed over the videos and the police initiated investigations before arresting one of the women yesterday for cheating. "My uncle is a very gentle man. He is very even-tempered, but when the women continued to extort money after promising not to, he got more and more agitated. Sometimes he gives in to bursts of anger," says Ms Lim. 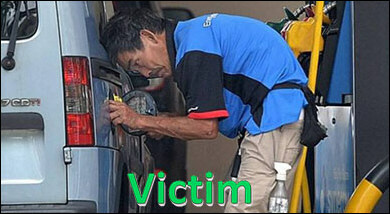 His colleagues at the petrol station had seen the two women coming round to look for Mr Tan but did not know why. He had no idea how to get out of his predicament, and was too afraid to tell anyone. He now lives with Ms Lim, who is looking after him. My uncle was constantly hungry and was always borrowing money from my mother and the residents at Kim Keat Avenue. He has two jobs... I questioned him constantly until he revealed what was happening. The date was Feb 5, 2014. The place, MOS Burger at Toa Payoh HDB Hub. Mr Tan Soy Kiang had made a police report against the women two days earlier. But his niece Pamela Lim, 39 decided to confront the two women. 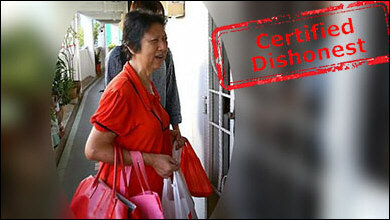 The two elderly women admitted on video to taking money from Mr Tan every month for the last 15 years, on the pretext of helping him repay his "debt to the Prime Minister". Both women, speaking in Teochew and Hokkien, confessed and apologised. They even promised not to harass Mr Tan again. And when it came to making restitution, both agreed to pay $500 a month each until they repaid the money they took from Mr Tan in full. Apart from having their confessions taped, the two women also signed a written one. But that didn't last. They were back to their old tricks in August last year, allegedly waylaying Mr Tan at both his workplaces. The last time was on Wednesdayat the Residents' Corner of Block 259 Kim Keat Avenue, a day after Mr Tan received his pay packet from the Esso station. Ms Lim alerted this reporter who saw Mr Tan meeting up with the women. Real estate agent Pamela Lim, 39, said two police reports were made since February last year. But in the first report, her uncle Tan Soy Kiang, 70, who is the alleged victim, told the police then that the money was handed over to the two women on "his own accord" as a personal loan. "My uncle is simple-minded and not educated, he has a low IQ and is easily misled. Being afraid of the two women, he might not have explained himself clearly or properly the first time round," Ms Lim says. It was a year later, after a second report had been made, that the cops started investigating and called up the women. One of them has since been arrested. Criminal lawyer Luke Lee says this is probably a case of cheating and the women can be charged under section 420 of the Penal Code. "Each time he hands over the money, it is one count of cheating. He has handed over his monthly salary in a period of 15 years. We are looking at multiple counts and it will (likely) be a custodial sentencing," Mr Lee says. Anyone found guilty faces a fine and can be jailed for up to 10 years. "On 3 February 2014, a 39-year-old woman lodged a police report at about 5.37pm informing (the police) that her 70-year-old uncle had been handing over money to two women over a period of time. "The police interviewed the man and recorded his statement on the same day. He informed (the police) that the money had been handed to the two women on his own accord as a private loan and as such, police's assistance was not required. "Based on the facts available at that point in time, police did not take any further action on the matter. Subsequently, police received another report from the same man on 4 February 2015 at about 4.09pm. "Acting on the further information provided, police initiated investigations and arrested a 65-year-old woman for cheating. Another 69-year-old woman is also assisting with police's investigations." Happy ending. Final amount raised = S$63,315.68.